Heritage in its broadest sense refers both to the tangible objects produced by past generations that have survived the ravages of time as well as the physical world around us, the natural landscape with its geological and biological features. Heritage therefore is not fixed or fossilised but rather, an ongoing, dynamic tapestry. In the process of being handed down from one generation to another, fresh elements may be added, as stylistic and technological changes, abetted by the ongoing catalyst of historical and economic forces, create an ever changing social and cultural panorama. Heritage is linked to identity and nationhood. In this respect, it is a unifying force. Yet it may also be divisive, if there are conflicting interest groups within a given society with differing or competing ideas of heritage. Heritage may also be manipulated, by political or religious forces, bent on achieving their own ends. Some examples will illustrate this. In Afghanistan, the centuries old statues of Buddha were destroyed by the Taliban. In Russia, after the Lenin led revolution of the early twentieth century that toppled the Romanoff dynasty, the many statues of past Tsars were mothballed, replaced by the heroes of the Communist movement. St Petersburg was rechristened Leningrad. Today, with a new political dispensation, Peter the Great looks down once again on his city of St Petersburg. Here in Barbados, debate has raged for some time about the place and relevance of the statue of Viscount Horatio Nelson. Is it a colonial imposition, now out of place in an independent Barbados? Is its meaning negative or positive? Similarly, the statue specially commissioned to represent the idea of Emancipation, has been given a specific identity. It is now personalised as Bussa….. even if it is adorned with an anachronistic pair of cut off jeans, hastily added by the sculptor as a result of a political directive to mask the previous nakedness of the initially conceptualised generic male. To give an example of the types of heritage that UNESCO within the context of the Caribbean has considered of sufficient universal value to merit their inscription in the list of World Heritage sites, one need only look at the Citadel La Ferriere in Haiti or Brimstone Hill in St Kitts as examples of built heritage and for natural heritage, the world heritage site in Dominica, Morne Trois Pitons, inscribed because of its montane rain forest with the two endangered species of parrot, the Imperial or Sisserou and the Red throated Amazon. Now, Bridgetown and its Garrison have joined the select list of World Heritage sites. This is a great accolade, an event with tremendous economic possibilities but carrying with it, awesome responsibilities of management. Let us look at the process by which this collective heritage came into being. The economic and demographic forces that catapulted seventeenth century Barbados into becoming “the richest spote of ground in the worlde” were marshalled by the early success this island enjoyed in the sugar industry. Sugar, even now in marked retreat, created the Barbados we know today. The wealth generated by the industry and the resident nature of the planter class, as opposed to the marked absenteeism of the other islands, created an embarrassment of monumental heritage. Over seven hundred plantations with their individual great houses with their furniture, over five hundred sugar wind mills and later, nineteenth century steam driven factories, over forty forts to defend this wealth, and the institutional infrastructure created to service the needs of the privileged section of the population…churches and schools. Though a great deal has been lost, much still survives, ranging from a pristine state of preservation to one of gross neglect. There are over two hundred plantation houses; many lived in, some awaiting a generous purchaser to resurrect them, like the proverbial Phoenix from the ashes. There are still over a hundred mills standing, though only one, Morgan Lewis mill, a Barbados National Trust property, still has its sails and machinery intact and still grinds sugar cane. The many forts that dotted the island’s west and south coasts have now largely disappeared, but the Garrison, born out of the late eighteenth century conflict for world supremacy between Britain and France, still survives, the largest and best preserved of Britain’s overseas military garrisons. The parish churches, with the stained glass windows and their profusion of centuries old funerary architecture still survive, playing their traditional role of administering to the spiritual needs of the Barbadian population. 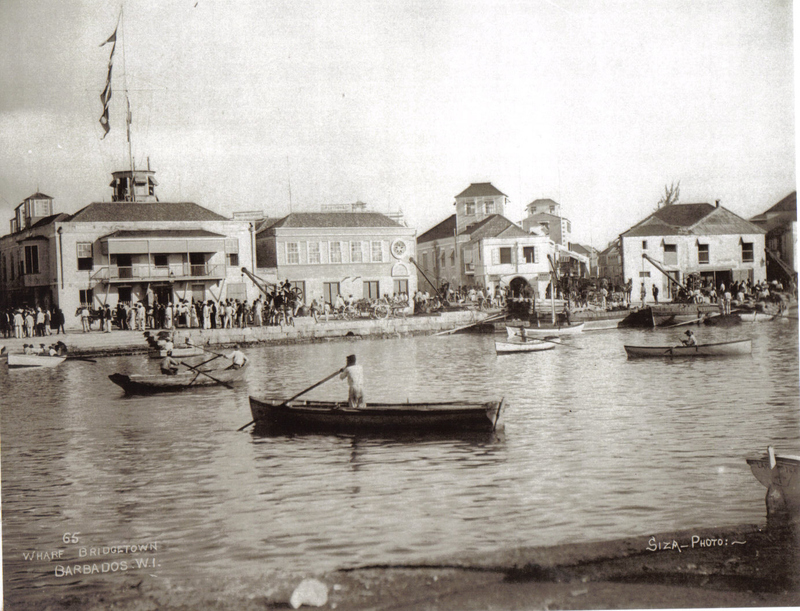 With its sugar export economy, the port of Bridgetown grew rapidly in the seventeenth century, forming the tripartite grouping of London, Boston and Bridgetown that dominated the British North Atlantic trading system. 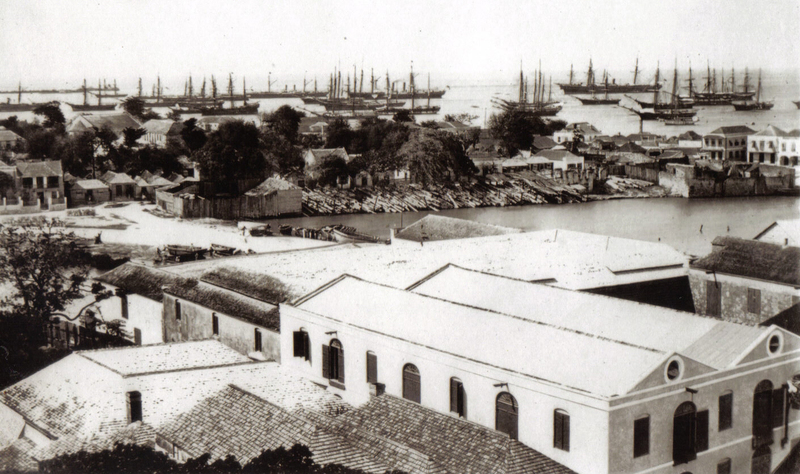 Unplanned, much like an English market town of the sixteenth and seventeenth centuries, Bridgetown grew and expanded. Despite the various fires and occasional hurricanes that affected it, some of the seventeenth century buildings such as the Dutch gabled Nicholls building survive, as well as a larger number of eighteenth century structures, such as St Michael’s Cathedral, the Masonic Lodge, the Old Town Hall and the Retreat located within the Harrison College compound. The bulk of Bridgetown is of nineteenth century provenance, many of the original structures masked by twentieth century facades. Out of the wealth of Bridgetown and the strategic geographic location of Barbados, came as noted, the magnificent Garrison, with almost one hundred buildings standing, most of which are still occupied and hence, in relatively good condition, as opposed to the shells of military endeavours which dot the Caribbean islands. Of what significance then is this UNESCO inscription. In short, if properly handled, it can be a catalyst for the revitalisation of Bridgetown. This will benefit Barbadians and at the same time, help in the creation of niche endeavours which will stimulate tourism and enhance hard currency inflows into our island. Tourism is a competitive enterprise. A look at our Caribbean neighbours will show the degree to which they have incorporated heritage into their marketing. Willemstad, Curacao is but one such example. We should also look at the work now being done in Falmouth, Jamaica. That late eighteenth century town is being resurrected as I write. Further afield, one only has to visit Charleston, South Carolina to appreciate the benefits that can accrue from a dedicated and coordinated approach to heritage conservation and preservation. A valid question, and one that is frequently asked is, to what degree does this monumental heritage reflect the patrimony of the enslaved as opposed to the free population. This question is of course related to the broader issue of “whose heritage?” One, in answering this question, should recognise that slaves were not entirely passive or robot like individuals, to be manipulated by their owners. They had personas, emotions, creativity and skills. This creativity and the numerous skills that accompanied it, be they cabinetry, masonry, carpentry, are reflected in the numerous historic structures which dot Bridgetown, most of them built be enslaved master craftsmen or their descendants. This present day generation have inherited a valuable patrimony. We will add to it for future generations but we also need to cherish and hold onto what we have been bequeathed. This is where skilful management comes into play. This must involve on going education as to the value of heritage and the possibilities of adaptive reusage. In this regard, the power brokers, be they the economic elites or government technocrats need to be constantly monitored and advised, because it is they above all other groups in our society who have been responsible for the greater part of the destruction of our material culture and our physical landscape which has taken place over the last fifty years. Change is a constant in the human saga. It is inevitable. But holding on to the signposts of the past, the collective heritage of our endeavours, is equally important. Without these sign posts, we are lost, adrift on a boundless, timeless sea, with no mastery or sense of direction. Karl Watson is a retired Senior Lecturer in the Department of History at UWI Cave Hill Campus. He is author of several books and articles, including Barbados the Civilised Island, Barbados First, Not For Wages Alone (with Patrick Bryan), The White Minority in the Caribbean (with Howard Johnson) and Old Doll, Matriarch of Newton Plantation. He is President of the Barbados National Trust, Chairman of the Barbados/Carolinas Committee, Deputy Chairman of the Bush Hill Tourism Trust Inc. and Editor of the Journal of the Barbados Museum and Historical Society.